Those who know me know that I am not into healthy food but at all. But Dan Cox, PR guy, kept saying I should check out Venice’s Seed Kitchen, the newish Japanese-American fusion vegan macrobiotic restaurant brought to you by Sanae Suzuki and her husband Eric Lechasseur (formerly of M Cafe de Chaya). I don’t know why he thought I’d like it but since he was hosting a lunch there, I figured why not. BTW this is a review by a non-veggie. If you’d like a true vegan’s perspective, check out this review on Quarrygirl.com. My friend/co-worker Erin and I visited the restaurant on a weekday. Erin’s more into the healthy food than I am, she being a regular Whole Foods and farmers’ market shopper, so I figured she’d be able to lend a more knowledgeable perspective on whether the non-meat tastes good or not. 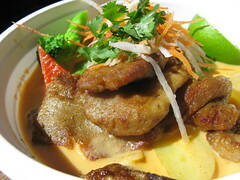 I ordered the Thai coconut red curry ($13.95) with seitan (say-tan) which is a wheat meat substitute. I figured the spicy savoriness of the coconut red curry would be enough to mask the flavorlessness of non-meat. I even had the shakers of spices like shisho powder and sesame salt at the ready. But turns out I didn’t have to worry as this seitan stuff was pretty damn good. It wasn’t rubbery or spongy or even bland like tofu. And it actually made me salivate. The Thai coconut curry dish itself was made with fresh broccoli, zucchini, potatoes, snow peas and carrot. Not exactly as yummy as my favorite Thai place‘s curry dish but good enough. The seitan is what really stole the show for me though. 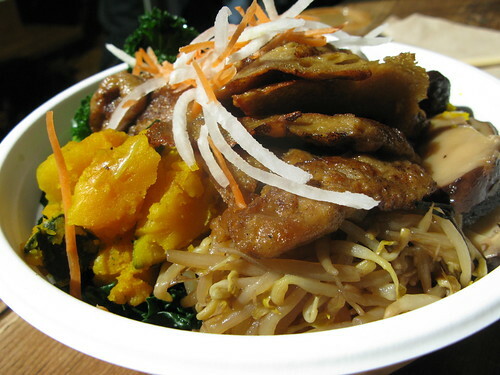 Erin ordered the Saisai donburi macro bowl with seitan ($14.95). I wasn’t familiar with half its ingredients like kabocha, arame and daily bean but she seemed to like it a lot. Enough so that she made a note to take our vegetarian co-worker here the next time he was in town (he works in Fresno). BTW, I discovered later that the restaurant’s Web site features a glossary of the ingredients! Besides the curry bowls and one-dish grain bowls, Seed also offers paninis, burgers and salads. For drinks you can choose from stuff like barley iced tea, artisan soft drinks and organic coffee. There’s even dessert, made with maple or brown rice sweetener. A refrigerated glass case by the counter displayed a beautiful selection of cupcakes, cookies, truffles and mousses but we were, of course, intrigued by the cupcakes. I picked the vanilla coconut and chocolate while Erin went for a couple of green tea cupcakes for her and her boyfriend. These cakes sorta looked like muffins topped with a high hat of cream but we were optimistic. 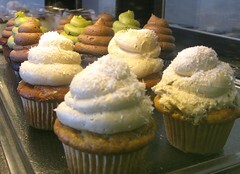 Unfortunately it was misplaced hope as when we tried the cupcakes back at our desks we found them to be very bland. They didn’t taste like the flavors they were supposed to represent and instead of a cupcake texture they truly did have the density of muffins. Erin wanted to call her boyfriend to tell him to not even bother taking a bite of the green tea cupcake she left on his desk. Yeah, we took no pleasure in these desserts. But then again, I had to think of this from the perspective of a healthy eater. Perhaps someone not exposed to the likes of Sprinkles, someone who always ate healthy and cut sugar from their diet would LOVE these cupcakes. They wouldn’t know what my standards of a good cupcake taste like and therefore they wouldn’t be missing out on anything. Ah well, at least the faux meat tasted good. The prices ($9 and over) for the dishes make it difficult to consider Seed a regular lunch spot but it would be good for a casual dinner. I’d pick it over the vegetarian-friendly Mao’s Kitchen down the street for that; not crazy about the food there. There’s even a metered parking lot out front. 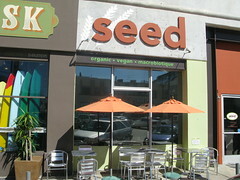 More pics of Seed Kitchen. Dude, I love that place. The chef is a seitan artiste. 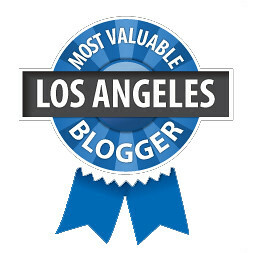 It’s the best seitan in LA. I liked the cupcakes, but yes, I usually do the granola-eatin’ thing. I only had my first Yummy cupcake a few weeks ago and dissolved into seizures of ecstatic joy (it was the bacon & pancakes cupcake). OMG that cupcake sounds evil! I must try it! Oh yeah, I guess it would be good if I left a link, huh? I like Ayara in Westchester. when will they get vegans to eat fake veggies made of meat?